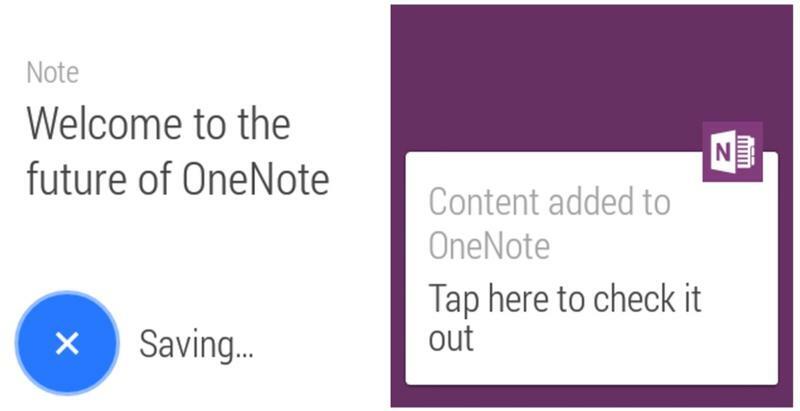 Microsoft rolled out a pretty big update for OneNote today, adding support for Android Wear, iOS 8 and improving the app on Windows Phone. There’s a good amount to unpack here but the big news is the company’s first app for Android Wear, which offers a taste of Microsoft’s plans for the budding wearables market. OneNote for Android Wear is extremely simple, which makes sense considering the bare-bones approach Google took with its new smartwatch operating system. Microsoft’s new app does just one thing: take notes. Just say “Take a note” to launch the app and then speak. Once you’re done you’ll get a notification letting you know the note has been saved and offering a chance to see it for yourself. There’s also an update for iOS that adds support for Apple’s new mobile OS, making it easy to grab content from the Internet, save photos and send files to your friends without needing to leave the OneNote app. Finally, Microsoft is updating the Office Lens feature on Windows Phone. Now you can snap a photo of written text or documents and automatically convert them into Word documents, which should be great for taking notes in class. With improvements for OneNote on three major operating systems it’s nice to see Microsoft sticking to its promise of building great services for competing platforms as well as its own. We’re curious to see what else the company has planned, especially for Apple’s upcoming smartwatch when it launches next year.